What Does Genesis 22:3 Mean? 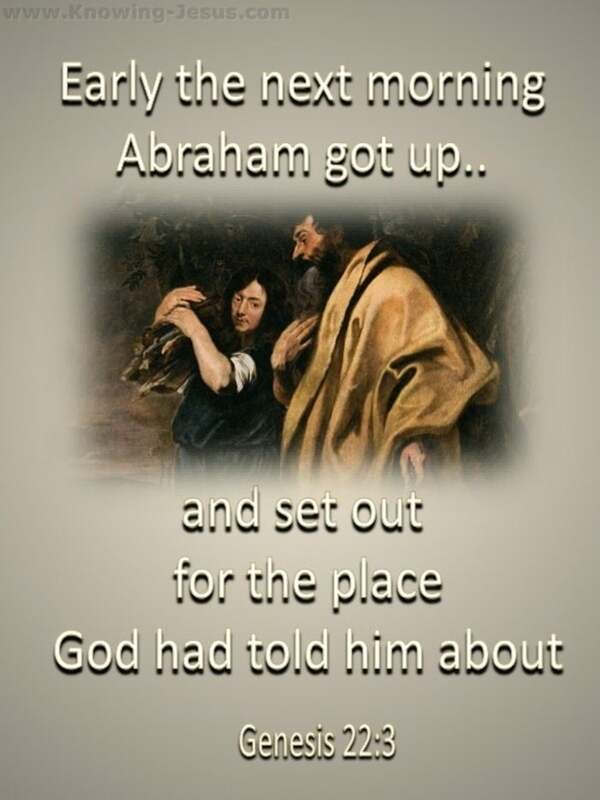 The next morning Abraham got up early. He saddled his donkey and took two of his servants with him, along with his son Isaac. Then he chopped wood to build a fire for a burnt offering and set out for the place where God had told him to go. Abram trusted God to bring him into a land flowing with milk and honey. 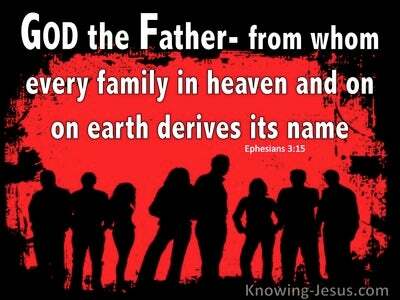 He believed God would give him the son of promise, make him into a great nation and that through his Seed all families of the earth would be blessed. 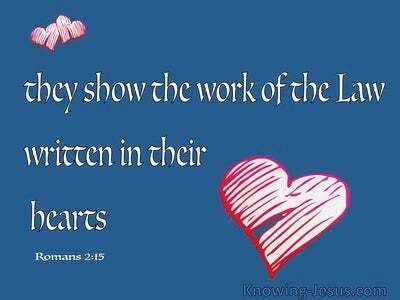 Abram believed God and it was credited to him as righteousness. God gave him a new name and was with him. But decades passed, and God wanted to test his servant Abraham, so God said, "Take your son, your only son--yes, Isaac, whom you love so much--and go to the land of Moriah. Go and sacrifice him as a burnt offering on one of the mountains, which I will show you. So, Abraham rose early in the morning…"
When God chooses to test us, He does not do it through the things we hold lightly but through the things that are closest to our hearts. Sometimes it may be through a person, or through our finances – through our home or family or maybe through our health or perhaps our reputation. 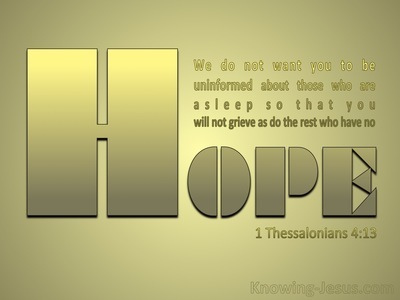 But we are all called to offer up our own “Isaac” in one way or another and it is because God is testing your love for Him and your trust in His word - for when your faith is tested, your endurance has a chance to grow and your hope and trust in the Lord develops and matures. 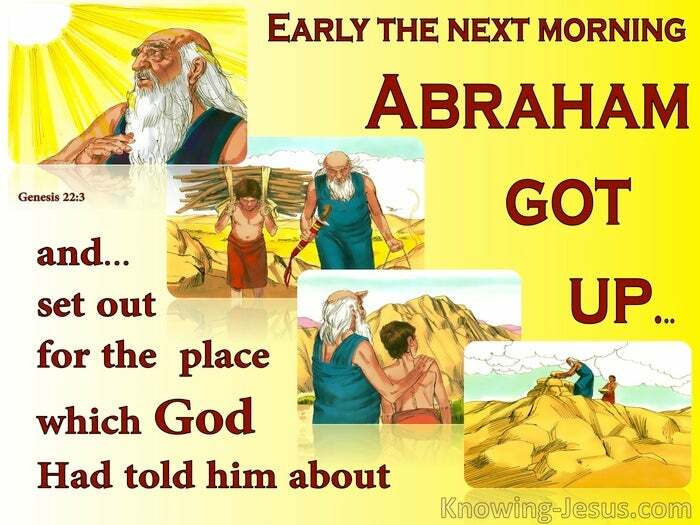 Abraham obeyed immediately and set off early the next morning to carry out the task that God had set. He did not delay or prevaricate, He did not question or argue, but his action demonstrated a trust in God that has caused Abraham to be called the father of faith. We do not know how he felt but trusting God should not be influenced by feelings – nor should obedience be dictated by logic, for God’s ways are often the antithesis of human logic and well-meaning counsel from others, can often oppose the will of the Father in our lives. 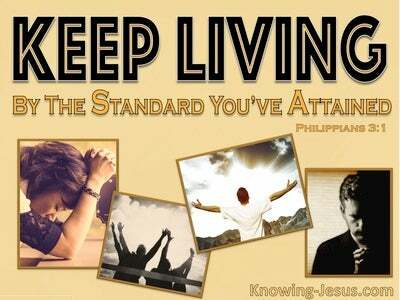 Abraham’s confidence in God had been tested before and although he did not always understand, he had learned that God’s ways are unlike his own but can always be trusted. He realised that in everything God has a godly reason. Likewise, when we are called on to follow a path of faith, that is beyond our human understanding - wisdom is to obey immediately, and sufficient grace will always be our portion.